In our review of Scream Factory’s deluxe Blu-ray two years ago, we called 1985’s Return of the Living Dead one of the greatest horror-comedy hybrids of all time. 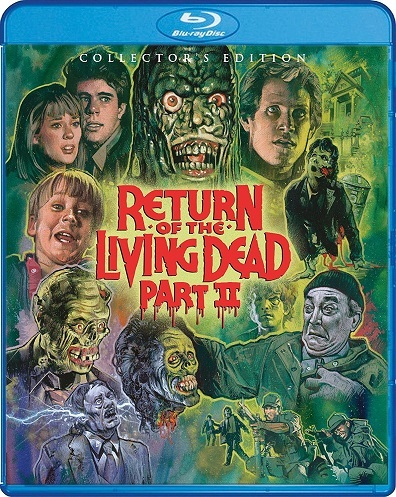 Its sequel, Return of the Living Dead Part II, released in 1988, falls into almost the same genre, though we’d choose to flip the descriptors. Where RotLD was a horror-comedy, RotLD II is more of a comedy-horror. Part II opens with a military caravan driving barrels of the first movie’s zombie-producing chemicals through a small Southwestern town; the pot-smoking driver hits a pothole, and one can goes flying over the side of a bridge. It’s discovered the next morning by a couple kids who dimwittedly pop it open, unwittingly re-animating all of the corpses buried in the local cemetery. The smartest kid of the bunch narrowly escapes, rounding up his sister and a visiting cable guy (Twin Peaks’ Dana Ashbrook) before attempting to find help. They hook up with two ill graverobbers (RotLD’s James Karen and Thom Mathews, in new roles), a high-strung girlfriend, and a huckster doctor (Mary Hartman’s Phil Bruns) as they discover the town’s already been evacuated and that they’re on their own against the zombie horde. It’s no surprise that those expecting a tonally-matched follow-up to Dan O’Bannon’s cult classic come away befuddled by Part II. The first packed tons of dark humor around several truly frightening and/or even thought-provoking scenes. (After perhaps a dozen viewings, the half-corpse’s explanation of what it feels like to be dead still sends shivers down the author’s spine.) On the other end of the spectrum, Part II is a bunch of slapstick comedy wrapped up in a gory zombie theme. Part II’s zombies crack jokes, comment on their flatulence in exaggerated southern drawls, make cheap references to Michael Jackson’s Thriller video, and momentarily stop munching brains to fixate on an aerobics video. This didn’t necessarily have to be a problem – classics such as Evil Dead 2, Dead Alive, and even the first RotLD feature some downright silliness – but RotLD II lacks any real horror element. There’s no sense of danger or peril when the zombies aren’t used as threats, but only as punchlines. Plus, Part II’s protagonist is a precocious kid, which feels like a weird choice for an R-rated zombie movie. There’s nothing wrong with the actor, but his presence sets the movie up to be something more kid-oriented along the lines of Invaders from Mars when that’s definitely not the intended audience. The same people who turned up for Linnea Quigley’s undead striptease in the first movie were probably disappointed to find a movie that, were it not for some gratuitous violence against zombies and a stray f-bomb, could have almost gotten away with a PG rating. All of those criticisms aside, there’s plenty about RotLD II that’s gone underappreciated. The practical zombie effects, while not as good as the first movie’s, are a heck of a lot better than the ones you’d see in many other zombie films from the era. Many of the gags are laugh-worthy. It’s fun to see Ashbrook pre-Bobby Briggs, and both Thom Mathews and James Karen are fun in their return to the series – it’s just a shame their characters are so much flatter than the ones they played the first time around. Scream Factory’s super-deluxe Blu-ray release builds upon the already-impressive amount of bonus materials available on the older DVD edition. New to this version is a nice, half-hour long featurette on the movie’s SFX work, two fresh audio commentaries, and on-camera interviews with the director, composer, and actor Try Fromin (who plays the uncredited, herb-smoking truck driver at the start of the film.) With the carried-over extra features, it amounts to hours and hours of bonus materials. The main draw, however, is the new 2K scan of the film, which looks really strong, and the high-quality audio of the film’s original soundtrack – which, again, is not as great as the first movie’s classic punk mixtape, but features a couple choice Anthrax cuts. Thank you for sharing the post! It’s nice to find the news about this album.